Easy access, level pull through site. Hosts very helpful. 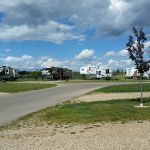 We camped at St. Albert Kinsmen RV Park in a Motorhome. We have stayed here a few other times in past years, but usually for no more than a week. This year we decided to spend a month in Edmonton. This is a nice campground with limited amenities, but its location close to Edmonton is a plus. Well maintain and generally good Wifi. (It was actually down for a couple of days, but since we were staying a month it was too much of an inconvenience. It was down over the weekend so someone just here for the weekend would have probably annoyed.) Nice clean restrooms and showers, but no laundry. Nice walking and biking trails nearby. Good paved interior roads. 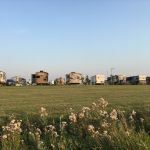 We camped at St. Albert Kinsmen RV Park in a Fifth Wheel. Very quiet and well maintained rv park. Park, playground, and trails nearby. Was told there is a dog park across the road but did not go due to having to cross tall, muddy grass areas with short legged, small dog. Friendly and helpful staff. 30 minutes to downtown Edmonton via easy access to freeways. 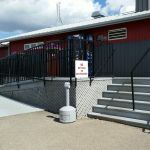 We camped at St. Albert Kinsmen RV Park in a Travel Trailer. One of the 5 best campgrounds we've ever stayed at. Service is like Concierge Service at a Monaco Hotel... Park has lots of full-timers driving massive coaches, fifth wheels and Class A. Makes for a very nice campground. They do accept smaller units without a problem. Manager lives on site and is helpful, and then some. Facilities are extremely clean, all connections are state of the art. Manager extremely knowledgeable of attractions, and is very friendly. This campground sets the bar very high... We camped at St. Albert Kinsmen RV Park in a Travel Trailer.